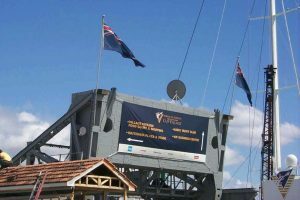 Cable AML’s 12 GHz Digital Broadband Broadcast transmitters were used to provide live pictures of The America’s Cup yacht racing to the Cup Village at Auckland’s Viaduct Basin in New Zealand, where the contestants lived and prepared their yachts. 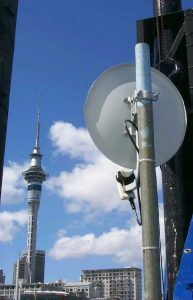 The digital signals are broadcast from Auckland’s 280 meter Sky Tower, and are received using Ku band digital receivers in the World Cup Village. The transmitter is located on the 61st floor of the tower at a height of 220 meters and the antennas are another 60 meters above that. Coaxial cable is used for the initial 10 meters to get into the tower core, where a circular waveguide carries it 60 meters straight up to the transmit antenna. Sectorized custompatterned high-gain antennas were provided by Cable AML to match optimize coverage by matching the required azimuth radiation pattern. The transmitters have been developed in conjunction with the transmission arm of TVNZ, Broadcast Communications Ltd. They have the ability to broadcast more than 70 channels of digital video and/or data. The current system configuration uses multicarrier MPEG-II video with QPSK modulation. Cable AML has developed and delivered the digital transmitters, antennas, in-band repeaters, and AGC (Automatic Gain Control) units for the state-of-the-art system.